What kind of boats can I race? The 2011 series races start Wednesday, June 22nd and go through Wednesday, August 3rd. 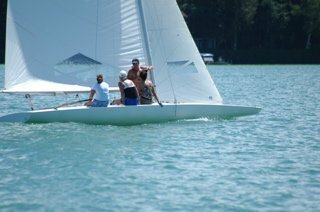 1:00pm: Meet at the LYC to rig your boat, or rig your boat at your house and sail over! 1:30 to 1:45: Report to the Committee Boat. Give them your name and boat number for score-keeping purposes. 2pm: Races start! We'll do 2 to 5 races, depending on the wind. Can I borrow a LYC boat? Yes! You can sign up to borrow a Butterfly for the Wednesday and Saturday races. Sign-ups are posted outside the clubhouse. All 10 boats should be available, and we allow a 2- person wait list. If you do not come to rig your boat by 1:00pm, it will be given to other sailors. How are the races scored? A sailor's season total is the sum of the sailor's 20 best races. Fleet races take place on a triangle course which, thanks to our dedicated race committee, is set up each day based on the wind. The course is generally set north of Brady's Point, when the wind is from the North, and south of Brady's Point, when the wind is from the South. The committee boat leaves from the Leland Yacht Club approximately one hour before the start. Information about racing location can be obtained from the committee prior to their departure. Please call Betsy Schmidt at 256-9734 with any questions. The course for the handicap races is run using 11 permanent marks placed at various points around the lake. This map of Lake Leelanau shows where these marks are located. These races start at Brady's Point itself.